Since 2003 Condor Moving Systems has provided the highest quality service for anyone making a local move. Condor Moving Systems is licensed by the Texas Department of Transportation to provide local moving services and insured. We are proud members of the Southwest Movers Association and hold Pinnacle Movers status which commits us to maintaining the highest industry standards as a local moving company assuring our clients that we are providing local moving services that are always efficient, reliable and safe. Disassembly of furniture pieces Certain furniture items cannot be safely moved without disassembly. Some examples of these items include: bed frames, dressers with mirrors attached, and two piece china hutches. Our full-time movers will disassemble these items and reassemble them upon delivery to your new home. Ready to assemble (RTA) or pressed wood furniture, bunk beds and cribs will not be disassembled by our movers. It is however recommended that you disassemble these items for safe transport to your new home. In addition, due to safety issues, we cannot disconnect, disassemble or reassemble electronics, major appliances, exercise equipment, trampolines, play grounds or swing sets. Loading/Unloading Our crews will carefully load all your belongings into our 26 foot air-ride equipped moving trucks. Air-ride is a special suspension system that provides a smoother ride for your belongings. When all the items are loaded, straps are used to secure your belongings in the truck to insure the load does not shift during transport. 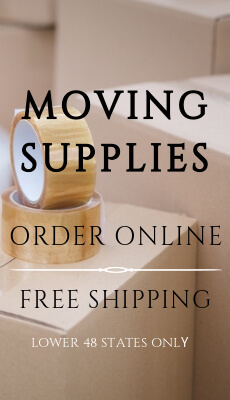 Upon arrival at your new home, all items will be unloaded. Generous blanket padding Prior to loading, our movers will wrap your furniture with heavy duty pads to prevent nicks and scratches during the move process. At your new home, the drivers will remove these pads from the furniture and place the items in the rooms you request. Placing your furniture in designated rooms When our movers arrive at your new home they will place all your major furniture items in the rooms requested. A floor plan of your new home will be a great asset in deciding where you would like the items placed. It is a good idea for the customer to have the rooms marked as master bedroom, Johnny’s room, etc to avoid any confusion during delivery. Reassembly of furniture pieces that were disassembled Condor will reassemble any furniture pieces that were disassembled by our local mover to make the transition into your new home easy. Valuation Coverage at carriers minimum liability of $0.60 per pound per article Your estimated cost of services includes release value protection of sixty cents per pound per article for your belongings which is the minimum carrier’s liability. If any article is lost, destroyed or damaged while in your movers custody, your movers liability is limited to the actual weight of the lost, destroyed or damaged article multiplied by 60 cents per pound per article. Please contact your sales consultant if you wish to purchase additional valuation coverage for your move. At Condor for local moves we only use state of the art moving equipment such as our 26ft moving truck. Our local moving trucks are equipped with an air-ride suspension system in lieu of conventional springs. Vehicles with air-ride are supported by a series of rubber cylinders and filled with compressed air allowing for a smoother ride for your furniture. A lift gate system is used to bring your items onto the moving truck versus the old traditional ramp system preventing any added stress to your furniture. Last but not least, all Condor’s trucks are equipped with a strapping system where straps are used to secure furniture on the inside of the moving box to prevent items form shifting during a local move. Condor Moving Systems will never use a pick up truck and trailer to move your household possessions as they are not specifically designed to transport household goods as our trucks are designed to do. A local moving company providing local moving service in Arlington, Dallas, Houston, San Antonio, Austin, Fort Worth and surrounding cities. We stand behind our local moving service; from your initial inquiry for a moving quote to the careful placement of your last item by our movers; we look forward to assisting you with your upcoming local move. Please contact our sales office at toll-free 877-460-6683 or complete an online quote request to be contacted by one of our friendly Moving Consultants for further details about our local moving services.